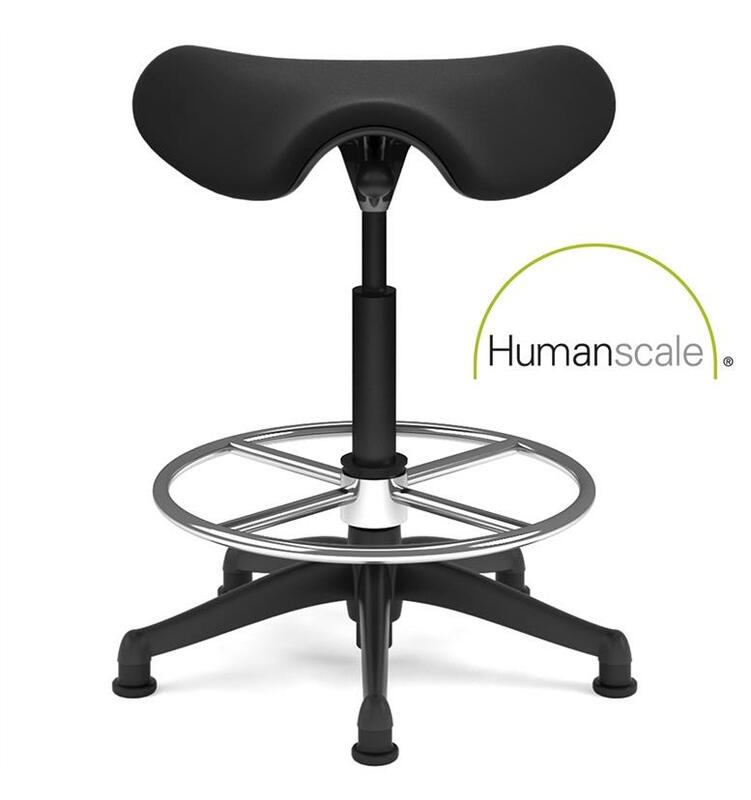 From the award-winning Freedom seating line, Humanscale brings you a new comfortable and ergonomic stool. The Saddle is a versatile, sturdy, and most importantly, comfortable alternative to the normal task chair. What sets the Saddle apart from other stools is the unique shape of the seat. The triangular cushion aids users in sitting in a ‘saddle’ position, with hips opened, thighs lowered and the spine a healthy, comfortable curve. This posture when sitting helps to actively fight against slouching. On top of all these benefits, the Saddle reduces pressure points in the legs, allowing for a longer, and more comfortable seating experience. The Saddle is height adjustable for those of all heights; it has the option of a foot ring for foot and knee comfort, if needed. The saddle seat itself comes in a wide variety of textiles, including disinfecting options for healthcare environments. The sturdy frame comes with three different color options: titanium, polished aluminum and graphite, to fit in with any color scheme. We love the Saddle because of the unique shape, and how it fights against slouching. The great minimalist look works in doctors or dentist’s office, as well as home offices. This stool is perfect for anyone looking for a change in normal task seats, or who wants a seat that will help your back stay healthy.